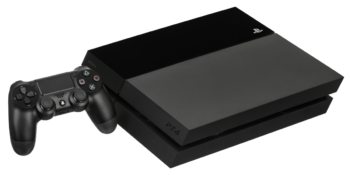 The PlayStation 4 is Sony's entry into The Eighth Generation of Console Video Games. It was released in North America on November 15, 2013 for the retail price of $399, in Europe on November 29, 2013 for the retail price of 399 (£349 in the UK) and in Japan on February 22, 2014 for ¥38,980. Traditionally, Sony developed their own chips for use in their consoles. However, developers complained that these chips were hard to program for due to poor documentation and complicated designs. Additionally, none of these processors went beyond the PlayStation application as Sony had hoped. The Cell processor in the PlayStation 3 for instance failed to break into the supercomputer market despite various attempts. As a result, Sony asked what the developers wanted in their new system. This led to AMD's Jaguar platform being selected, along with 8GB of very fast GDDR5 memory. Each has its own advantages: AMD's platform uses the x86-64 architecture that powers most PCs. Since x86-64 is a popular, long-running architecture (debuted in 2004, with x86 itself debuting in 1978), there's plenty of developer experience with it. Meanwhile, 8GB of GDDR5 deals with issues of both the size and speed of memory budgets, a constant bane to video game programmers. The DualShock controller also received an overhaul. The DualShock 4 is more ergonomic, with slightly bulbous handles and concave triggers and thumb sticks. The "Start" and "Select" button were replaced with an "Options" button for game menus and a "Share" button to access sharing features. A clickable touch pad and speaker were added to the middle of the unit. The bottom of the controller features a headphone jack for voice chat or full audio. Lastly, the controller features a light bar on the top, similar to the PlayStation Move's scepter for move support or general status / mood indications / Color-Coded Multiplayer depending on the game. The console is region free, and launched without the online DRM that Microsoft planned to implement for Xbox One in 2013 (which Sony used to mock in their troll ad a while after the announcement ). While game installs are mandatory, PS4 supports an "install as you play" feature on digital and retail games. As with the PlayStation 3, the hard drive is user replaceable. A PlayStation Vita remote play feature adds similar functionality as the Wii U's tablet controller, which was later extended to Android devices via an App when the Vita tanked. The PlayStation Now service provides streaming for older generation games. Also, a software emulator allows for users to play digital, enhanced copies of PlayStation 2 games. Online multiplayer, except for "free-to-play" or subscription games, requires a PlayStation Plus subscription. However, only one subscription is required per console, meaning multiple user accounts can use the same subscription. The subscription also carries over from the PlayStation 3 and Vita. Benefits like free monthly games, discounts and early access content are also provided with the subscription. Support for VR head mounted displays such as Sony's Project Morpheus and Oculus Rift was in development. Eventually Sony's own Project Morpheus was chosen and it was rechristened PlayStation VR, and has been given an official launch date of October 13, 2016. Unlike the PlayStation 3, which didn't produce a net profit until 2011, nearly five years into its lifespan, Sony broke even on PS4 at launch through the sale of online subscriptions, accessories, and games. Sony sold 4.2 million units by January 1, 2014, and 6 million by March 3, 2014, making it the fastest-selling console of all time. In fact, due to Sony's external financial troubles in their other fields, the excellent sales on the platform were responsible for serving as the only area where the company made a profit in 2015. In March 2016, Sony announced that they're working on a refresh of the PlayStation 4. Unlike refreshes of previous generation PlayStations, however, the refresh won't just be a size-reduced version of the console but will also include a hardware upgrade to handle 4K and VR more efficiently. While fans are indifferent of the news and some even reacting positively as they were aware that Microsoft is doing something similar with Project Scorpio (which eventually became the Xbox One X), some developers developed backlash over the fact that their games will now need to be able to support the new PS4 in addition to the original one, which is puzzling since Sony announced that the new PS4 would be fully backwards compatible with all existing games, and the only thing that's changed is how the console has a faster CPU and better GPU. Sure enough, not one but two refreshed PlayStation 4 systems were announced on September 7, 2016. One of them was a size-reduced version of the original console called the PS4 Slim, which was heavily leaked days before the announcement, and a new bigger version with better hardware called the PS4 Pro, which was made with 4K TVs in mind. On May 2018, Sony announced that the PlayStation 4 is "Entering the final phase of its life cycle", and that focus will now shift to providing a better online experience to users . 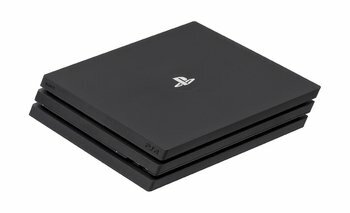 There have been absolutely no word on whether Sony is working on a successor console however, aside from a suspicious date of March 2021 provided in the tweets and a bug report filed with AMD regarding the Ryzen architecture by SCEE engineers that raised a couple of eyebrows and speculation. The CPU has eight x86-64 cores running at 1.6GHz each. The GPU has 1152 GPU shaders running at 800 MHz, for a performance rated at 1.84 TFLOPS. ARM-type low-power processor for background processes, network tasks, security and streaming. 8 GB GDDR5 system memory running at 5.5GHz with a total bandwidth of 176GB/s. 2.5 to 3.5 GB reserved for the operating system. Heterogeneous System Architecture provides a common memory space shared between CPU and GPU. 256 MB RAM chip for secondary ARM processor. 500 GB Hard Drive. Can be replaced with any 2.5" hard drive, including SSDs. Blu-ray drive rated for 6x speed, or about 27 MB per second. 4K Resolution support for some content. Performance rated at 25.6 gigapixels per second and 51.2 gigatexels per second. HDR image support for games if implemented as of System Software version 4.00. 802.11n and Bluetooth 2.1 wireless capabilities. The CPU has eight x86-64 cores running at 2.1GHz each. The GPU has 2304 GPU shaders running at 911 MHz, for a performance rated at 4.198 TFLOPS. 8 GB GDDR5 system memory running at 6.8GHz with a total bandwidth of 217.6GB/s. 1GB of DDR3 "scratch RAM" also linked to the ARM processor, background non-game applications can be suspended to this memory space if the console is switched to a game while it's running a non-game app like Netflix. 1TB Hard Drive. Can be replaced with any 2.5" hard drive, including SSDs. Blu-ray drive is the same model used in the original PS4: rated for 6x speed, or about 27 MB per second- a design decision that baffled fans as the drive is not fast enough to handle 4K UHD Blu-ray Discs which goes against what the PS4 Pro stands for, and also against Sonys own optical media (made worse that rival Microsoft did upgrade the Xbox One X with a faster blu-ray drive to enable 4K UHD Blu-ray Disc playback). While games are not necessarily rendered natively in 4K, they are sampled in a way that offers higher resolution visuals than 1080p. Some games do run on 4K, such as PS 3 remasters and downloadable titles, while others use either dynamic resolution which scales the output image depending on load while keeping interface elements at native resolution, interpolation techniques such as reconstruction or checkerboard rendering, or a combination thereof. Performance rated at 29.15 gigapixels per second and 131.2 gigatexels per second. HDR image support for games if implemented. 802.11ac and Bluetooth 2.1 wireless capabilities.